Our implementation process relies a great deal on customer input from the teams that will be affected by the FPM software onboarding. 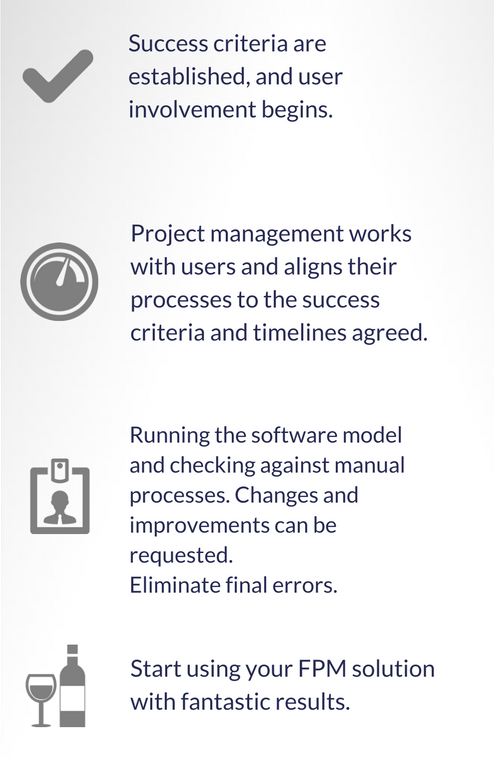 From the cost vs. benefit analysis through to the implementation and troubleshooting stages as seen below (click here for the full process infographic), Cortell liaises and consults with the teams involved in order to ensure a seamless transition into the new process. The benefits of this not only touch on the training of staff. A great deal more information can be gathered in the early stages of the consultation, by investigating and sharing common Financial Performance Management problems, current hurdles, and exact requirements. The better the information at the start, the better the proposed solution will be. Therefore, we consult extensively before generating the high-level plan. The extension of the original high-level plan involves a great deal of consultation to drill-down into the models and calculations. Bringing out the complications within these details is key, for a smoother implementation phase. Once the business requirement specification is signed off, implementation begins. Issues can be identified and fixed immediately. The teams involved are trained on the software while troubleshooting. This double benefit expedites the onboarding process while ensuring quality and functionality in the final product. Running the model and excel in parallel allows us to check results, identify problems, and execute changes and requested improvements. Finding the areas where human error has created glitches in the solution and ironing out the kinks in implementation is key, and cannot be done without taking the knowledge and needs of the finance team into consideration. Contact Cortell to find out more about our financial performance management solutions and processes. Email David McWilliam at dmcwilliam@cortell.co.za.